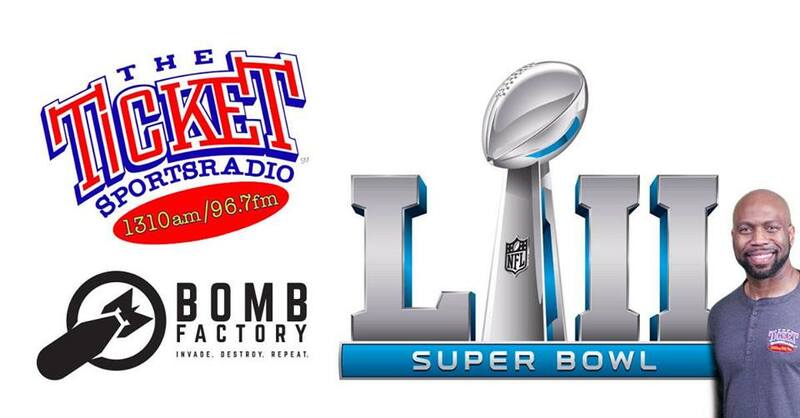 FREE SUPER BOWL LII WATCH PARTY brought to you by @THE TICKET 1310AM/96.7FM & The Bomb Factory hosted by Donovan Lewis! Killer BBQ! Squares! Raffles! Parlor games galore! Drink specials! Ticket schtick! The game is scheduled for February 4, 2018, t U.S. Bank Stadium in Minneapolis, Minnesota. The Super Bowl LII halftime show will be headlined by Justin Timberlake. Catch all of the action shown on the Bomb Factory’s 30 foot HD big screen. There will be incredible food from Wiles BBQ, drink specials, and awesome prize giveaways each quarter. Everyone has a party for the big game but there’s only ONE Official Watching Party of The Ticket and it’s at the Bomb Factory in Deep Ellum!